the Way Into the New Generation! W.I.N.G! We are interested in international exchange with other institutions, organizations and people on all levels. Please feel free to contact us with any ideas and suggestions. We also welcome visitors, volunteers and foreign working holiday staff. NPO WING is a charitable organization in Osaka/Japan, which makes various offers to persons with mental, physical and multiple disabilities. The name NPO WING stands for Non Profit Organization – the Way Into the New Generation and points out our aim to break new ground in the Japanese social and welfare work and to open the Japanese society for the concerns of all people. Our organization is focusing on the work with persons with severe and multiple disabilities that affect their learning and important life functions like eating and using the toilet. 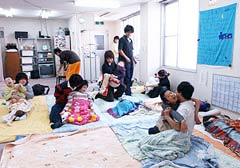 Especially for these people there are few alternatives in the Japanese society, other than the care at home or in a hospital. The aim of our work is to introduce our users to a life, which consists of more than basic care and health services. At present there are around 90 users from the age of 18 using our day-care centers. The facilities are open from Monday to Saturday. The users are picked up in the morning from their homes with our wheelchair friendly taxis. During the morning we do the bathing, the cooking and the “morning meeting” together. Our day-care centers are equipped with big and handicapped accessible showers and bathrooms, which makes the bathing time for the users enjoyable. At the “morning meeting” the staff and users talk about the things to do for the day, plan events and sing together. Important information about the condition of the users are read out. The lunch is an important part of the daily routine, we take our time to eat, talk and laugh together. The afternoons are used for a variety of activities like walks, handicraft works, events in the “Tamariba”-community center and Working Holiday Culture days. Starting from the late afternoon the users are taken back to their homes. Beside the day-care centers we also offer family support services. These services are aimed to persons of all ages and are at present used by more than 100 persons. Our staff goes to the homes of the users and supports the daily housekeeping and basic health care. But also walks, visits to the cinema, administrative formalities etc. are part of the service. Recycle shops, “Tamariba”-community center etc. In addition to the basic care and health support we try to offer a variety of therapeutic, social and cultural services to our users. For this purpose we run the “Tamariba”-community center and recycle shops in each day-care center. In the recycle shops the users sort, label and sell household goods and clothes, which we receive as donations. The profit is handed out to the users. The “Tamariba”-community center is open to our users and people from the neighborhood to improve the exchange between them. For this purpose we also organize regular events like concerts, movie screenings, Kids-clubs, flea markets etc. The whole year around we organize day trips, travels lasting several days, concert visits and big events like the Christmas party. All these activities we understand as opportunities for our users to participate more in a socially involved life. Since the year 2000 we employ foreigners who visit Japan on a working holiday visa. These working holiday staff stay with us for up to one year and contribute to the open and globally aware atmosphere in our organization. In the last ten years we were able to welcome more than 70 foreign staff from Australia, Canada, China, Denmark, France, Germany, Great Britain, New Zealand and South Korea. Beside the working holiday staff we employ 3 foreigners from Australia and Germany as regular staff.